In my first post on investing I defined it, gave several examples and identified common elements. This post focuses on the all important and not to be missed benefits of tax advantaged investing. Tax advantaged investments are those that allow for a period of tax-free growth, example retirement plans in the U.S. like IRAs, 401Ks, defined contribution plans, in the UK ISA’s and Canada RRSP’s. They basically work the same, you put away money during your working years and those amounts are allowed to accumulate tax-free, at a fixed age, 70 1/2 in the U.S. for example, you need to begin distributions from those accounts. The amounts not distributed are allowed to continue accumulating tax-free. This is incredibly valuable because it allows compounding to take place at significantly higher rates. Let’s go to an example. 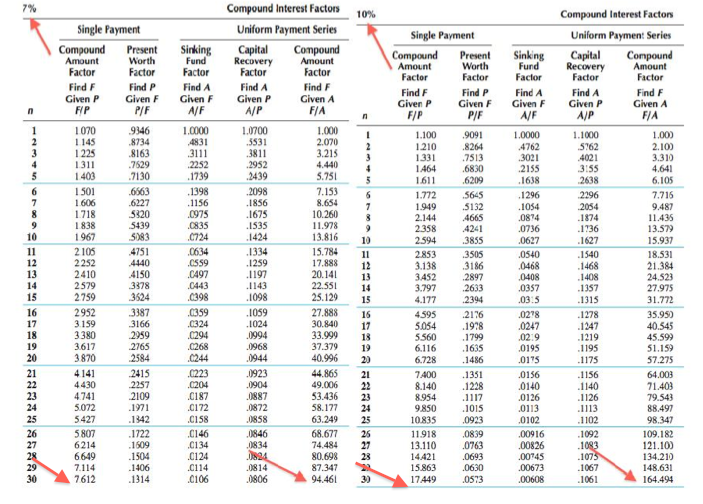 The table above shows the accumulations when compounding at 7% and 10%, respectively. If I assume tax rates are 30%, 3% represents the tax cost of a 10% compounded average annual return (10% x 30% = 3%). In other words if I earned 10% on my investments, in a tax advantaged account they would accumulate at 10%, outside of a tax advantaged account they would be taxed at 30% or 3% of 10% so the net earnings would accumulate at only 7%. You’ll see shortly that this 3% makes a huge difference in the final accumulations over extended periods of time. Back to the example. The red arrows show what happens to $1 compounded over 30 years and $1 added annually per year over 30 years. At 7% $1 grows to $7.61 after 30 years and $1 per year for 30 years grows to $94.46. If we use a 10% factor the $1 grows to $17.45 ($17.45/$7.61) an increase of 229%. The $1 per year to $164.49 ($164.49/$94.46) an increase of 174%. I think you get the point, tax advantaged investing needs to be part of any savings plan. For a frame of reference the compounded average annual returns from 1926 – 2010 for US small cap stocks was 12.1%, US large cap stocks 9.9%, government bonds were 5.5% and US treasury bills were 3.6%. Jay Sanders, CPA/PFS, CFP® "There's lots and lots of Numbers in business and your personal life but only some are relevant. The key is to know which one's matter, worry about them and forget the rest." Gallery | This entry was posted in Financial Literacy Basics, Investing, Money in your 20's, Personal #s and tagged Financial Literacy, Financial Planning, Personal Finance, Personal Financial Planning, Retirement Planning. Bookmark the permalink. Several people have said it, but I believe Einstein is credited most often. “Compound interest is the 8th wonder of the world.” thomas Jefferson said, “the man who understands compound interest will earn it and the man who does not understand it will pay it.” Great post Jay! Thanks as always. Absolutely love the Jefferson quote, I’m going to use it. Thanks for sharing. Can’t wait to start mine when I get my full salary! Great post. Made sense even to a layman such as myself. Interesting point. It proves the beauty of compound interest yet again.